Built during Jamestown’s Golden Age, when Jamestown’s Reuben Fenton was New York State Governor—located in the center of town, This is the oldest publicly used structure in Jamestown. Boasting downtown’s most recognizable Spire of its kind, Visible from major thoroughfares all over the city. Gaining momentum after smash hit productions of Chautauqua’s Got Talent, Godspell, Tuesdays with Morrie, Nightfall With Edgar Allan Poe, Winning Streak, The Great American Trailer Park Musical, Rent, and several world and US Premieres and having had over 100,000 people come through her doors in her first 4 seasons, The InSpire Development Center only plans to keep growing!! 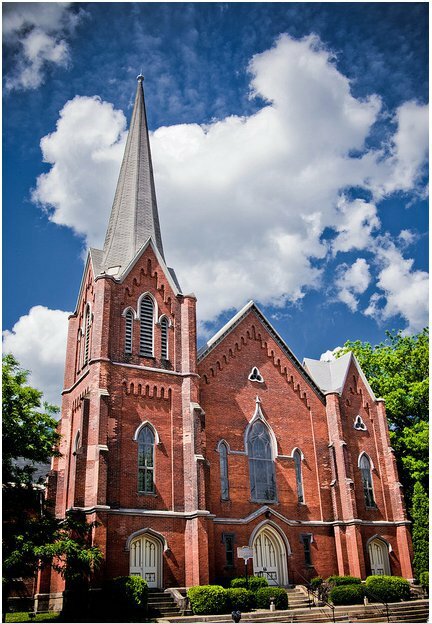 Not only does The Spire host regular theatrical programming, it is home to dozens of entrepreneurs, artists, performers, groups, churches, and organizations. This Building will not become another static reminder of Jamestown’s by-gone glory, but a beacon of inspiration representing Jamestown’s Renaissance.